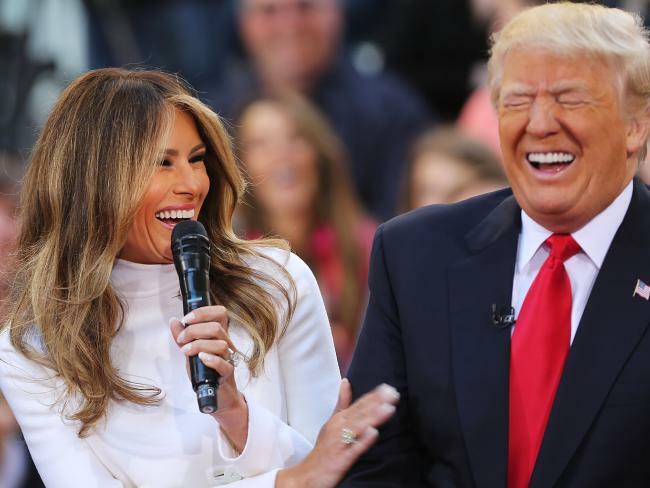 science-astrology: The "latent" Synastry of Donald and Melania Trump! If the title of this blog came as a surprise to you, then you should know that true astrology is actually scientific! What is not scientific is the popular, predictions orientated astrology you probably are familiar with! The "latent" Synastry of Donald and Melania Trump! Although I am a sort of "synastry-holic" guy, the idea of studying Donald Trump's and Melania's synastry was never particularly appealing to me. As most people, I was seeing in these two an unscrupulous businessman and an avid "gold-digger". So, to me there wasn't interesting stuff there. Not to mention the fact that nobody seemed to know Melania's time of birth, meaning that an eventual synastric study of theirs would be rather incomplete. But things have changed and Donald Trump is now the elected president of the United States while his wife Melania the First Lady! A synastric study of theirs seems more appealing than ever. Let's take a quick look at their natal charts. Donald has a versatile Gemini Sun, while his Moon resides in the fiery and expansive sign of Sagittarius. His Ascendant is in the regal sign of Leo (although in the very last degree of it)! Donald was born during a Lunar Eclipse (and probably this has to do with his peculiar, "obscure" relation to women at large). Let's move on to Melania now. We are still lacking her verified time of birth so we don't actually know her Ascendant nor the "domification" of her planets (thus there are no Houses in her chart - the one you see bellow - while the reported time of birth is a conventional one). In such a case we are obliged to focus mainly on the zodiacal signs of the "Lights" (Sun and Moon). But even there the lack of Melania's verified time of birth produces a controversy, because if she were born before 1:27 am (Slovenia time) she would then have a Sagittarius Moon (the same as Donald's). But if she were born after 1:27 am she would have a Capricorn Moon - and that would make all the difference! If both Donald and Melania have a Sagittarius Moon then you can see the power of their synastry right in front of your eyes! When two people share the same Moon - in the same sign and in conjunction - they feel a deep, visceral sense of "community"! A rich emotional flux is developed among them and a profound "comprehension" of each other. And although the time frame for this to occur is relatively small (00:00 to 01:27 am) there is a strong probability that Melania was indeed born within that specific time frame. Mathematically though the odds are against it and she might very well have been born after 1:27 am - having thus a Capricorn Moon. In that eventuality things would change drastically - both for Melania and for their relationship. You see, Melania would then have a Taurus Sun and a Capricorn Moon, an extremely earthy and realistic combination, prone to materialism and social climbing (especially if the individual is attuned to the "lower frequencies" of the Taurus - Capricorn combo) ! Well, to many of you that might sound a lot like Melania but to a Synastry connoisseur the striking fact (with this Capricorn Moon scenario) is that Melania's chart bears no astrological affinity to Donald's chart! Her "Lights" are too earthy and "feminine" (Sun in Taurus, Moon in Capricorn) while his "Lights" are "airy-fiery" and both "masculine" (Sun in Gemini and Moon in Sagittarius). There is no common astrological ground among them. Actually, their two charts not only do not bear any substantial resemblance but in addition they are not compatible! 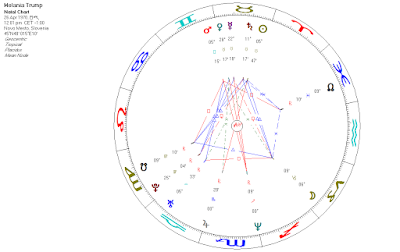 Here is the "bi-wheel' of their Synastry (the inner chart is Donald's and the outer one is Melania's). So, what's going on with the Donald - Melania Trump relationship? Is theirs an arranged match, a mere marriage of convenience? Because under an astrological point of view the two do not seem to be very compatible. Well, that's not entirely true, as there are at play here some astrological elements that are rather invisible at first sight but crucial in the long run. I have developed a theory on this, calling these "difficult to spot" but crucial elements "Latent Synastric Elements" (LA.S.E. in abbreviation, you may read the gist of that theory in my article "Latent Synastric Elements: The secret fuel of love" , at the "Sasstrology" website). As you know, the Sun in a woman's horoscope is telling us a lot about the type of the masculine figure she is mostly attracted to. In Melania's case her Sun forms a conjunction to her Saturn, thus her ideal man should be an authoritative, socially recognized and probably older than her figure. Trump actually represents all these traits. Furthermore, Melania's Sun - Saturn conjunction bears a strong affinity to Donald's Sun in the Tenth House (since that House is traditionally harboring Saturnian values)! In addition, Melania's Sun forms an opposition to her Jupiter, thus her ideal man should have some Jupiterian traits too (he should be exuberant, optimistic, larger than life and "rich" - figuratively or literally speaking). 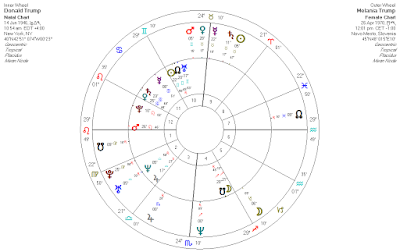 And Donald is Jupiterian alright, since one of his "Lights" (his Moon) is in Sagittarius (the sign ruled by Jupiter), while his Sun is forming a trine aspect to his Jupiter! 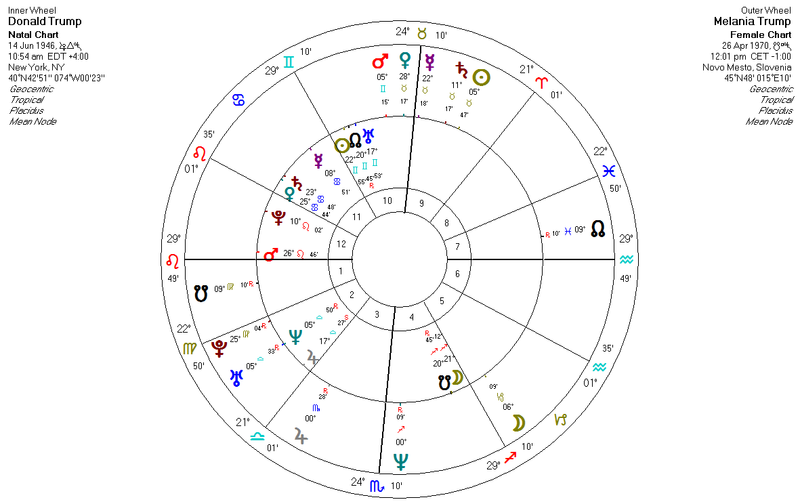 What is striking here is the fact that in Donald's chart his Venus (a pivotal planet in love affairs, indicating the attributes of our ideal partner) is replicating almost identically the planetary aspects of Melania's Sun (his Venus is conjuncting his Saturn and is forming a challenging aspect to his Jupiter)! His Venus replicating her Sun's planetary aspects, that should definitely be accounted as a latent synastric element! Actually, as we delve deeper in their Synastry we realize that Melania is the "stabilizer", the soothing and "grounding" force in their relationship! And Donald needs a lot of "grounding" for sure, having both his "Lights" in mutable signs. And Melania is complementing him in other ways too. 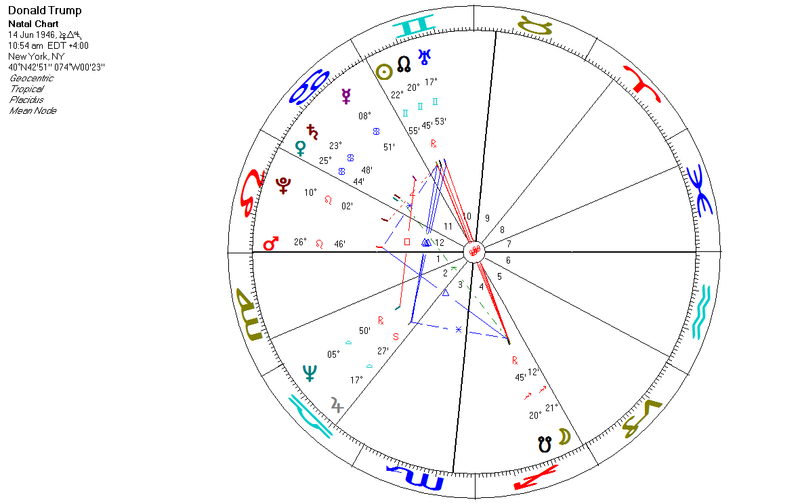 Surprisingly, Donald's Moon resides in a very emotional, tender, family orientated sector of his chart (in his Fourth House). In that sector the Moon is much dignified. But there is another side to it, as the Fourth House Moon might often become ultra sensitive and touchy. If Melania has a Capricorn Moon she is to a certain extent complementing and strengthening that sensitive side of Donald Trump (the Fourth House and the sign of Capricorn being somehow two complementary areas of a horoscope). And the First Lady does that even more so if we take in consideration the fact that her Venus and Mars are synastrically falling in Donald's Tenth House (meaning that she becomes even more Capricornian when standing by his side, when interacting with him)! We already mentioned that planet Venus is of paramount importance in love affairs. Melania's Venus is conjuncting her Mercury, meaning that her ideal partner should have some "mercurian" traits, he should be witty, versatile, communicative. One part of her craves for a mercurian partner and guess what, Donald definitely is one (as he belongs to the sign of Gemini, ruled by Mercury). Another part of Melania craves for a Martian partner (because her Venus is forming a conjunction to her Mars, as well). And since his early childhood Donald has been the martian type of guy (his Mars in conjuncting his Leonian Ascendant - allegedly he was feared by many of his school mates). Even more so, Melania craves specifically for a martian Gemini type of man (as her Mars resides in the sign of Gemini). Well, Donald absolutely fulfills that side of hers too! 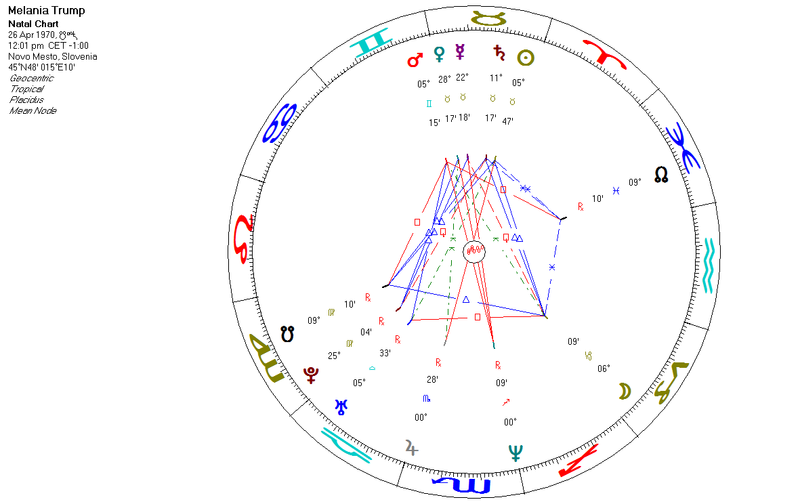 In Melania's chart, her Moon is interacting with Uranus (forming a square aspect). 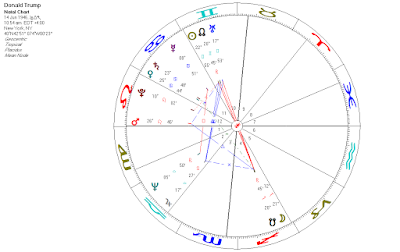 In Donald's chart, his Sun is interacting with Uranus (forming a conjunction). So they both have an "uranianized" "Light" (not by chance they got into politics). That uranian factor should be accounted as another "latent" synastric element! This isn't by no means a complete study of Donald's and Melania's synastry. They do have many interesting "explicit" synastric inter-aspects (like the ultra "merging", intense and powerful inter-aspects that Pluto is forming with their respective "Lights". Also, the romantic but probably "disillusioning" as well inter-aspects of Neptune with their Moon and Venus - and several others). That kind of stuff though pertains to a slightly different field (and an exhaustive synastric analysis should normally take something like 15 - 20 pages). In this article I just tried to give you a different synastric point of view on the Donald's - Melania's relationship, focusing mainly on their "latent" synastric elements,which although not very obvious are utterly conditioning the quality of a relationship! The only thing worthy of speaking in his chart is SUN conj URANUS and NORTH NODE. His destiny is to destroy everything through Chaos. You would know this if you know a lot of people with Uranus conj Sun and Uranus opposite Sun. The US has now met its leader of self-destruction. Thanks for sharing this nice post. I really appreciate your blog. I love reading astrology and Horoscope blogs. Clooney - Alamuddin: a rather incompatible couple! The chart of the fatal “Air-Germanwings” pilot! Astro-analysis of George Michael's death (& life) - a "stellar overdrive"! Debunking the astrological - astronomical lies about 2012. How important is this date after all? First historical evidence on Alexander's the Great Horoscope! Is Ophiuchus the 13th zodiacal sign?